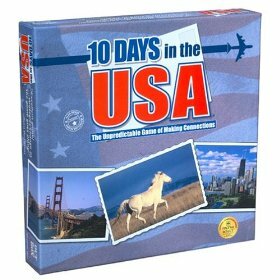 Wish I could give a great explanation as to why we like Ten Days in the USA so much, but I can't...just play it! It is fun and easy for all ages from some of the younger set all the way to adults. Start your engines and another destination in the 10-Days Travel Series… You have 10 Days in the USA – travel the country by plane, car, and on foot. Chart your course from start to finish using destination and transportation tiles. With a little luck and clever planning, you just might outwit your fellow travelers. The first traveler to make connections for their ten day journey wins the game.